Due to digitalisation, the sports industry is currently undergoing a transformational innovation. So-called wearable technologies, i.e., technologies that you wear near, on or even in your body, are the disruptors of the sports, fitness and well-being sector and transform how we do and experience sports and fitness. From a data handling perspective, we argue that there is an emerging need for standardisation and interoperability of data. Firstly, you may not want to lose the data you have captured due to an upgrade in sensor technology; secondly, when changing to new systems or technologies you want to compare with your current historical data; and also, for comparing and analysing between groups of people you need standards. As a consequence, with international standards the provision of safety and reliability measures will be enabled; these standards would provide economies of scale and give consumers the choice between products, thus, encouraging innovation. Gold standards and the usage of reference data sets (generated either in the field or in laboratory, depending on the specific research question) are key requirements and basis for data mining, particularly for validation of our models and algorithms. Especially in the field of Alpine Skiing, we focus on specific domain understanding as a prerequisite. Thus, we foster a close cooperation between computer science and sports science (University of Salzburg, department of sport science and kinesiology). Figure 3: Screenshot of SkiSense App for data collection in the field, Salzburg Research. 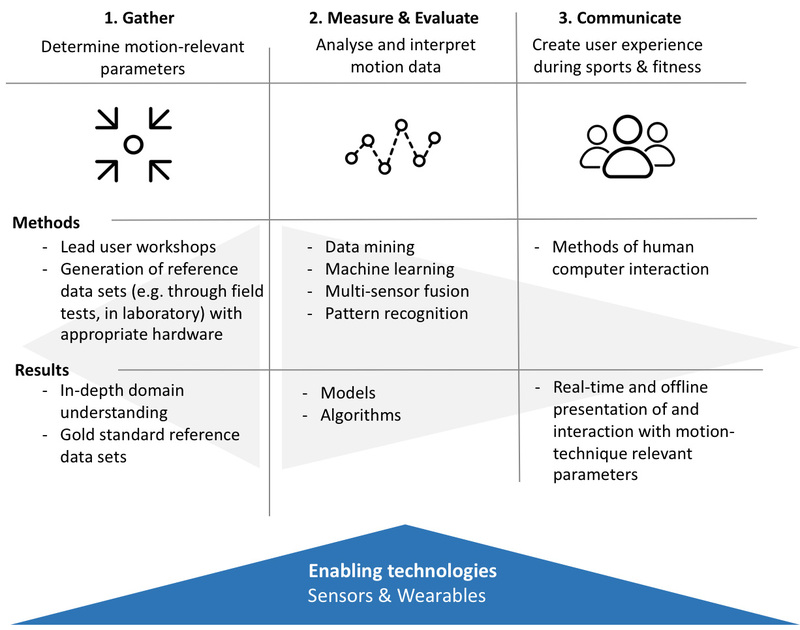 Motion analytics in the field: Based on inertial measurement units, pressure sensors as well as sensors integrated in smartphones, we aim at understanding and interpreting human motion. These sensor data allow us to analyse specific motion-technique relevant parameters in the field. Hence, we consider biomechanical and context-related parameters in the field. We use the generated data as basis for developing data-fusion algorithms and visual analytics. For validation of the automatized algorithms, we (i) perform laboratory tests when specific movements can be simulated properly, and (ii) subsequently use sport scientific interpretations from in-the-field measurements as reference by using e.g. video imaging. Data security and privacy: it is well-known that wearables collect a lot of personal data and often store them in some cloud service. Now, as users we want that data to be treated carefully and stored securely. Also, we do not want it to be shared with third parties. So, the right to have your data deleted is mandatory – even though for manufacturers and providers this is a huge challenge. Appropriate user interaction design patterns and feedback learning rules for seamless interaction in exertion are a must-have of future systems in the sports and fitness sector. Bear in mind that ultimately the athletes, the trainers and coaches, and also the spectators do not really care about technology. They like to be supported to achieve their best performance in a competition; they need to determine exactly whether the ball passed the line between the goal posts; their interest is in saving weight by using lightweight technology; they want to enjoy a day out with their families or mates; etc. So, whatever technologies rises, ultimately they need to support the sports experience. We distinguish between two ways of communicating with users: offline and online. Offline communication allows more possibilities in terms of interfaces and processing power for more complex algorithms, focusing on in-depth analysis for users. Whereas online communication during sports and fitness concentrates on the best possible support of users during their activities. We are firmly convinced that in the future the user interaction has to happen beyond the screen. This leads us again to think about future wearables, e.g. shaping interfaces or intelligent glasses – a first impression of not only motion but also emotional experience for sports application was showed by Smith at ISPO with its lowdown focus technology. In summarizing, we belief that the next thing in sports is to create long-term enjoyable experience and benefits through digital sports technology. So far, in sports and fitness many sportsmen and sportswomen have been using various gadgets in order to measure motion quantity such as duration, speed or steps during their workouts. In the future we will be able to get meaningful metrics with the technological support such as the quality of strike patterns, asymmetries and others. Nevertheless, ultimately, it is not so much about technical performance as such but more about the experience while being in motion – getting into the “flow” as some argue. https://www.wearable-technologies.eu worldwide marketing and innovation platform for wearable technologies. 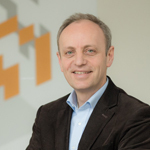 has been a scientific director of Salzburg Research since 2002. Salzburg Research is a non-profit research and technology organization (RTO), which conducts applied research in information and communication technologies (ICTs), focused on the “Internet of Things”. His research interests are in Web Engineering and trajectory computing. 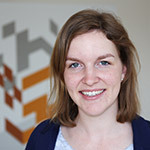 Verena Venek is PhD and data scientist at Salzburg Research. Her main focus lies in human motion analytics, in particular in the field of sports and fitness. 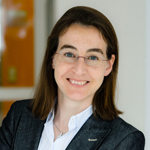 Elisabeth Häusler coordinates digital sports projects at Salzburg Research and is responsible for setting up project applications as well as R&D services for both, science and industry, in this research field.